You can hear it all throughout Blogland right now, almost everyone loves this time of year. As I've said before, I am no exception. For me it is another reason to be joyful and celebrate everyday. And to at last cool down a little bit and open the windows. And ..... to decorate the mantel for Halloween! This I totally love doing. It's a chance to embrace magic and whimsy and just remember the fun of being a kid this time of year. Welcome to my old friends and those of you coming by for the first time. I love sharing Fall & Halloween with you. I hope you enjoy your visit. Yes, it is black and white again this year. The art above the mantel this year is by the same artist that I featured last year. Many years ago when I first discovered her, she only worked in black and white ink and my guess is that is still what she does today since she did it so well. This particular art piece is Sleeping Beauty. Since I spent so many hours in the library as a child reading fairy tales I have a great fondness for beautiful fantasy art. Since the colors this year are still mainly black and white, this was a most a lovely choice for over the mantel. 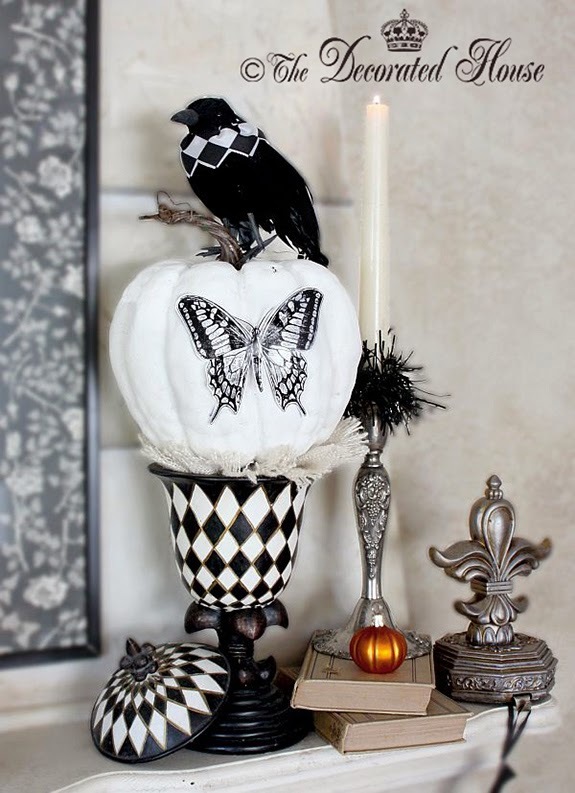 Along with the pumpkin topiary that is on the left, this simple white pumpkin with a black and white butterfly sits on top of a harlequin urn over on the right side. The raven wears a matching harlequin collar and is joined by vintage books, and silver, as well as a small glass pumpkin ornament. Although everything is mostly black and white, but there is a tiny bit of mellow pumpkin color as well. Even the fallen maple leaf brings in a touch of faded charm. The black and white toile pillows with the stripe, and black trim are always perfect this time of year. 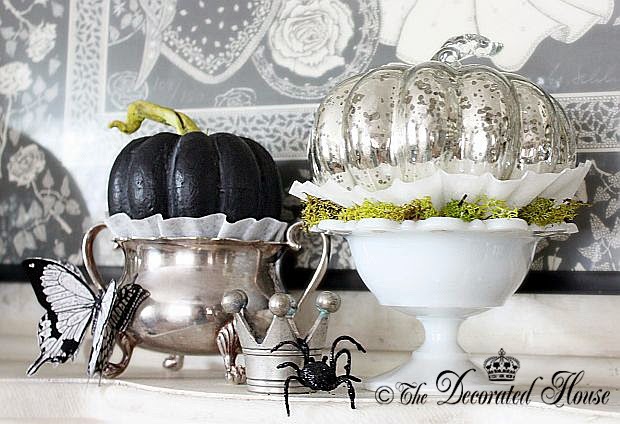 In the center rests a paper butterfly, a black painted baby size pumpkin sitting in vintage silver, while the silver mercury glass pumpkins is shown off by a white collar sitting in lime green reindeer moss in a vintage piece of milk glass. The little display is topped off with a little silver crown and a glitter spider. 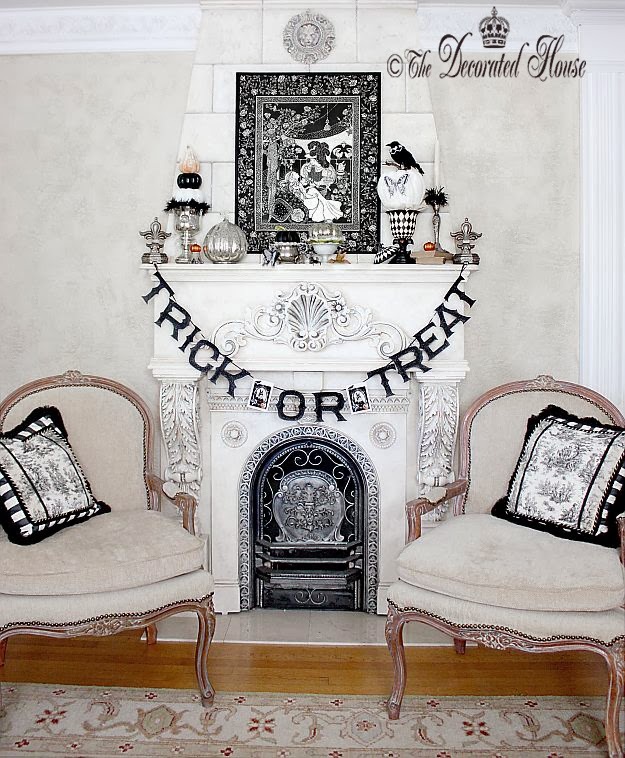 The trick or treat banner is glittered like the spiders and is a fun touch to the French style "fireplace" and Beau Bunny Bandito appears on either side of the word "or" in the middle of the banner. For Beau there is no "or" in Halloween. It is always Snickers, and dark chocolate for him. Halloween never looked so beautiful, Donna! You always do such a great job with your Halloween decorating. You put me to shame since my birthday is Halloween and I don't do half this decorating for it! I hope you got extra treats for having your birthday on Halloween! Donna, your decor always looks so elegant! Of course, I love black, white & silver. I love all the special touches! It fun to have a little elegance for Halloween isn't it? 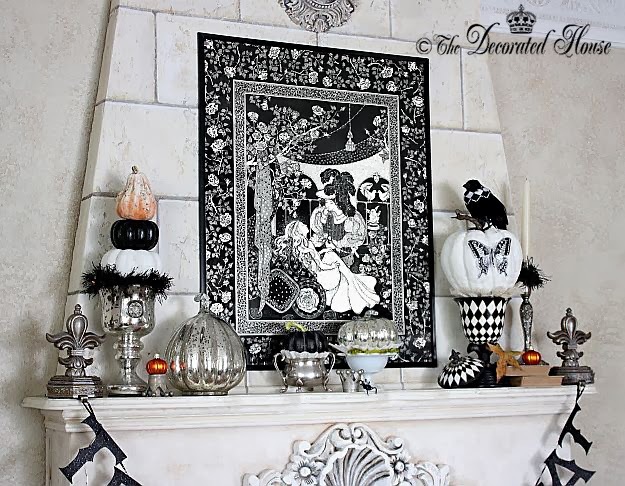 This is crazy gorgeous spooktacular! WOW!!! Your decoration is beautiful and very elegant, Donna. So nice to see you both. Thanks for stopping by and leave your sweet notes! Wow! Gorgeous Donna! I love the black/white/silver theme - just stunning! 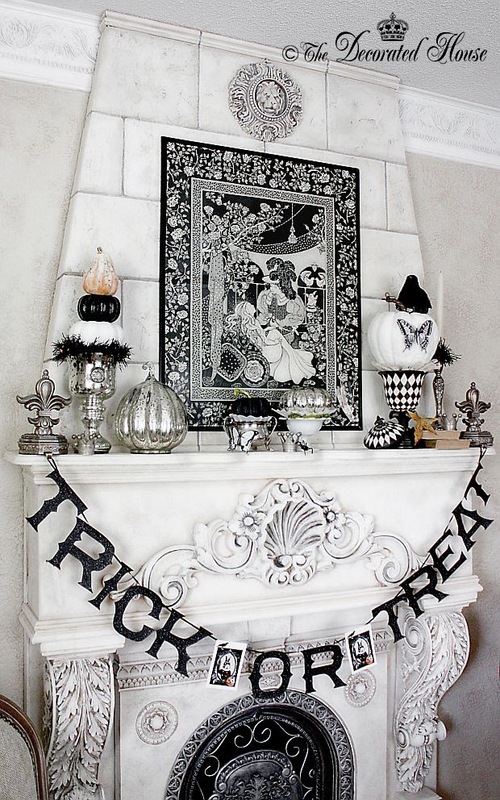 I especially love the harlequin urn with the white pumpkin (love the b/w butterfly on that). 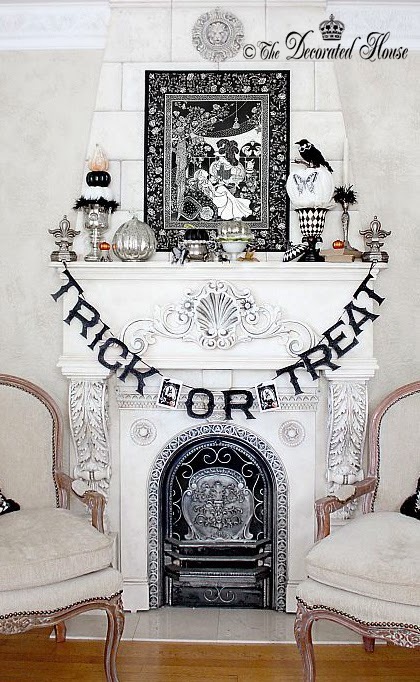 Like Kathy, said you always do such a beautiful Halloween mantel! Thank you for your sweet note Manuela. Happy Weekend! What a gorgeous mantle decked in such finery! The art piece is amazing and just perfect for the scene. Love the elegance that the black white and silver gives to the scape. Every little detail is a treat. Love it! So nice to see you Patti. Thank you for stopping by. Donna, I could not locate your email address. 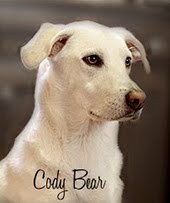 Just wanted you to know that you are one of my featured bloggers today in my Creative Bloggers Of The Week series. Just posted it. Head over to http://www.cozylittlehouse.com to see it. I found the Trick or Treat glittered letters banner a couple of years ago. I think it might have been from Joann's. It came with some kind of spooky skull or something which I have replaced with my dear Beau Bunny. Thank you for your kind comments. The only thing I can say about your mantel is, Wow! 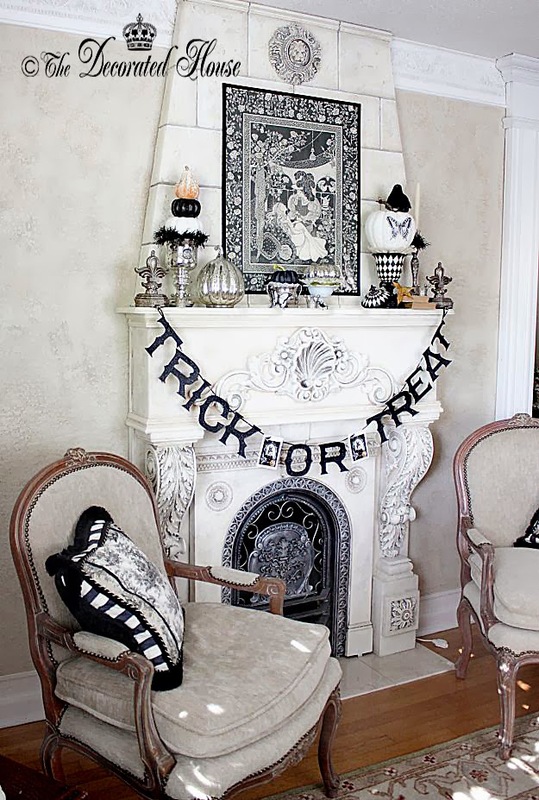 What a glamorous and gorgeous mantel! I love the black and white! Thanks for linking up to the "Get Your DIY On" Link up party! Be sure to come back Sunday at 7:00 PM if you have any more spooky outdoor décor! Stunning and amazing! I love it!